"The book has wide appeal in that the issues investigated - for example, the nature of science, practical work, the role of language, of technology and formative and summative assessment - are relevant and pertinent to science teachers' work in all school systems." 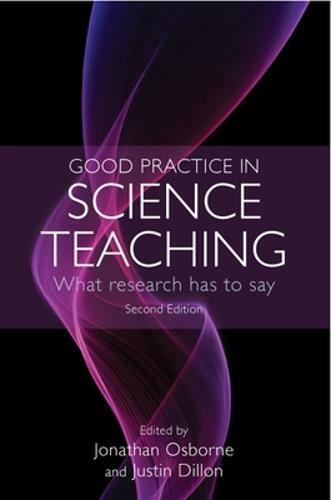 This new edition of Good Practice in Science Teaching offers a comprehensive overview of the major areas of research and scholarship in science education. Each chapter summarizes the research work and evidence in the field, and discusses its significance, reliability and implications for the practice of science teaching. Three new chapters covering: the learning of science in informal contexts; teacher professional development; and technology-mediated learningUpdates to every chapter, reflecting the changes and developments in science educationFurther reading sections at the end of each chapterEach chapter has been written by science education researchers with national or international reputations. Each topic is approached in a straight-forward manner and is written in a concise and readable style. This invaluable guide is ideal for science teachers of children of all ages, and others who work in teaching and related fields. It is an essential text for teachers in training and those studying for higher degrees. Contributors: Philip Adey, Paul Black, Maria Evagorou, John Gilbert, Melissa Glackin, Christine Harrison, Jill Hohenstein, Heather King, Alex Manning, Robin Millar, Natasha Serret, Shirley Simon, Julian Swain, Mary Webb.